Many executives in public companies sit on multiple boards of directors, meaning they have a vested interest in multiple companies. For example, if a board member sits on both Company A and Company B, then it's in this individual's best interest to ensure that Company A's decisions don't negatively impact Company B, and vice versa. This creates a 'link' or 'connection' between the two (or three, or four) companies. Within the largest 50 companies in the S&P 500 (the scope of this analysis), 39/50 (or 78%), are directly connected to one another through 1 or more board members. It's worth noting that the # of connections get much larger when you expand the scope beyond 50 companies or expand to second and third degree connections, but it becomes pretty difficult to fit into any sort of visualization, so I've limited scope significantly for this analysis. 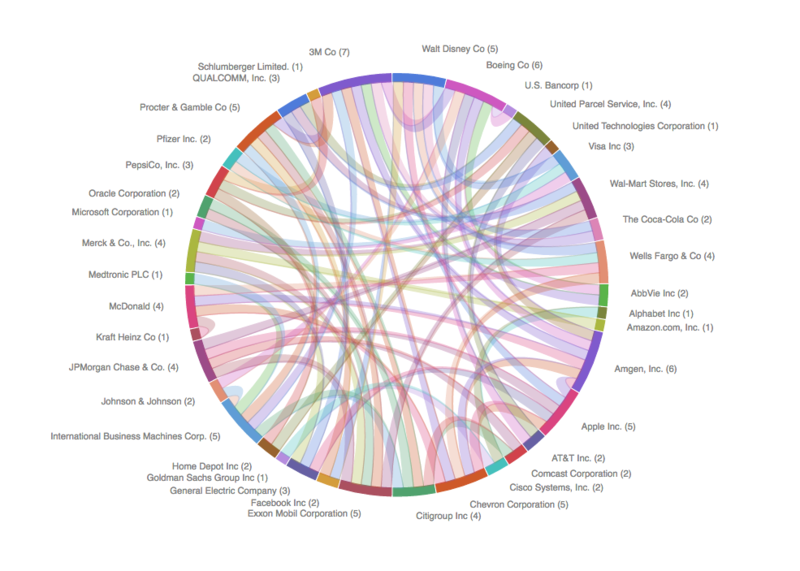 The below visualization shows the board member connections within the 50 largest public companies (if two companies share at least one board member, then they are flagged as connected). You can hover over a specific company to see its connection(s), and the # of connections for each company are shown in parenthesis next to the name. The above visualization is best viewed on desktop, but mobile users should be able to click in and out of the companies (you may need to long pause or refresh page to click out on mobile). A static image of the chart can also be found here.